Point shoes are known for being uncomfortable on their own. 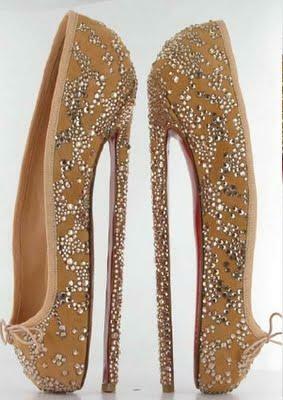 But leave it to Christian Louboutin to take this ballet staple to the next level-literally- with these new studded heels. Emblazoned with genuine Swarovski crystals, the 8-inch shoes are currently being auctioned off by London-based auction house The Summer Party to benefit the English National Ballet. And just in case you’re wondering, these aren’t the tallest high heels ever. In fact, they’re only half the height of the Guinness World Record Holder, which comes in at a staggering 16″. Khloe kardashian / shoe closet / louboutin / dream !